Dean Spanos, owner of the San Diego Chargers, called a meeting early this morning to inform the staff of the team that he plans to move the team to Los Angeles for the 2017 season. Committee meetings took place on Wednesday where the Chargers were just not a priority topic, and the league offered no additional money to help with current stadium efforts. Those close to the situation say the meetings were the last possible opportunity to find some solution. Nothing came, so the Chargers are moving on. It is far from set in stone, as there are still multiple hoops that need to be jumped through before the moving trucks are packed. 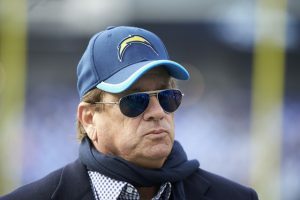 Spanos has done nothing official yet; he hasn’t informed city officials in Los Angeles or San Diego of his intent to move and has not filled in an official relocation letter. Should Spanos follow through with his plan then the Chargers would need to be out of San Diego by July 1st. Considering a practice facility and office space has already been leased in California by the team, they could be out much earlier than that. It’s fair to say that the Chargers potential move to Los Angeles has been talked about less than the Raiders move to Las Vegas, but it is still a significant league topic nonetheless. The Rams moved to LA this year and had a horrendous season, so it would be a big news if a team of the Chargers calibre were to make their new home the City of Angels for 2017.